We live in a “plugged in” culture, where students spend extended periods of time consuming visual images. This severely limits their visual memory or their ability to access and recall images and real-life situations that happened to them. Catch up on Part 1: Spelling Inside Out: Developing Visual Memory. There are a few contributing factors to consider when evaluating a child’s development of visualization and visual memory, such as whether or not a child has grown up in a language rich, interactive environment, full of imaginative play. Not many kids today say they have an imaginary friend. 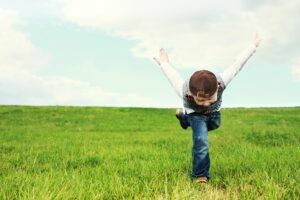 21st century kids don’t have an imaginary person in their lives because they are so totally plugged in that there isn’t room for anyone or anything else. They aren’t visualizing someone being there. When I was in the classroom, one of the things parents would ask about when they were telling me about their child was, “My daughter has an imaginary friend, is that ok?” I would actually tell them we should celebrate that idea! Buckle that imaginary friend into the other seat in the car, put a place setting out for them at dinner time, talk about the things they talk about with their imaginary friend because that’s really stretching their visualization and visual memory for ordinary activities. Visual motor play is another huge contributing factor to building early visualization and visual memory. More and more students are coming to school with poor language skills, having a hard time following directions, have a hard time just retelling stories that happen in their life over the weekend, or actually retelling a story that was read to them. They have difficulty recognizing letters and words, they have little imagination, they just don’t really have anything to talk about or anything to write about. As we began our conversation about visual memory and spelling inside out last week, we had quite a few teachers interacting with us on Facebook asking what happens if students don’t have the visual memory to remember the word ready? What happens if students can’t even visualize the word, let alone spell it inside out or even recall the last three letters? A foundation of visual memory must be built and developed before students will be able to visualize and play with 5-letter words like ready. We always start with a short 3-letter word, like was. 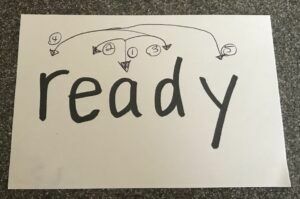 We can ask the same kinds of questions that we asked about the word ready, but there are fewer variables, which makes the task a bit more manageable. What are the first two letters? What are the last two letters? What is the middle letter? How do you spell was backwards? Can you spell it starting in the middle with the a and going to the w then the s? However, sometimes students struggle even with visualizing short words, so we have to back the bus up even further as we think about developing visual memory. Spelling inside out wouldn’t start until students are at least in 2nd grade and their brains are developed enough to recall letters in scrambled order. So what do we do before that? What comes before spelling inside out? It goes back to the exercise we talked about last week of having a student recall and picture the things in their bedroom. We need to help kids be able to replicate or see a scene in their mind. 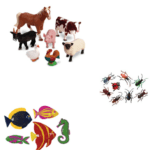 This can easily be turned into a game using those collections of plastic animals that come in different themes from Lakeshore or even the dollar store, like safari, farm, zoo, insects, etc. We can take these objects and build a scene that has the objects in a certain order. 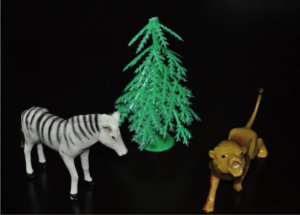 Let’s say you lay out a zebra, a tree, and a lion, in that order.Let the child look at the scene and see if they can replicate the order in which they see the objects exactly the way you see them. Then, cover the scene and change the position of one of the animals (in our case, the lion) so his head is now pointing away from you. See if the kids can figure out what you changed about the scene. There are lots of different ways we can help kids get better at this concept! Here are some activities that build on each other and are appropriate to help kids in K-2 develop visual memory and visualization skills. Even students in grades 3-5 who struggle with visual memory can use these activities to build their foundational visual memory. 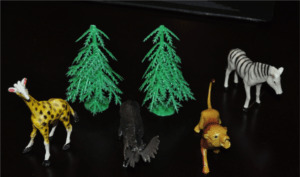 Use 3-dimensional plastic animals, bugs, trees, fish, people, etc. to make a scene that a child could replicate. 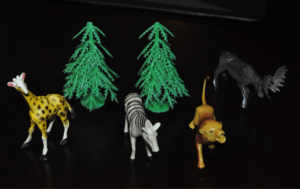 You might create a scene using three plastic critters. Let them observe it, take a picture of it in their mind, then cover the scene and see if they can recreate it exactly like yours. If a child struggles to replicate a scene with 2 or 3 things, you can increase the time they look at it until they can recreate it before you actually block or cover the scene. Gradually make the scene more complex by adding 4, 5, 6, 7 objects. Cover the scene and change the orientation or position of one object and see if the students can figure out which one you switched. You could show the scene for 10 seconds and see if they can figure out what was changed, then reduce it down to 5 seconds. Some students benefit from being able to manipulate the objects to put them into visual memory. The key here is to emphasize that students should use mental pictures, not auditory prompts or memorization techniques like repeating “red blue green, red blue green,” to remember and to actually visualize which object came first, second or third. Use 3-dimensional shapes (stars, circles, squares, triangles, rectangles), foreign coins, plastic critters, foam or plastic letters. Have students begin with three shapes and ask them to arrange them in any order. Then, put a screen or a visual block down and ask them if they can recreate what they did on the other side. Gradually increase to 4 or 5 shapes. As kids get better at this, allow students to manipulate the objects. Place the objects in a sequence or order. Students will need to remember the sequence with vision only. You can start with 3 objects in a sequence, giving students unlimited time to study the objects. Then increase it to 4 or 5 objects. Once students get better at this, you can then give them timed presentations where you might let them see it for 10 seconds, and then go down to 5 seconds to see if they can still visually create the sequence. In this picture, I have some yellow lacing beads – a cylinder, an oval, a cube, and a longer barrel with a line in the middle. They’re all yellow, but I have them sequenced a certain way. I can change the visual picture to see if the students can switch the order of it in their visual memory – so I might put the cube at the beginning and see if they can recall what object was changed. I also have a red cube, a green cube, a yellow cube and a blue cube. Show students the objects and see if they can replicate what they just saw. You can control the exposure time, but you don’t want students to repeat the order of the colors out loud. You really want them to visualize what colors come in the middle of the pattern? What colors come on the ends so they can recreate the image that they saw? Think of it a little bit like the inside out spelling, where students are playing with the order of the colors like they will eventually play with letters in a word. You can also try to do this with letters. Here you can see magnetic letters b, g, e. See if the child can replicate the pattern after seeing it. I can change the order of the letters, making it q g e and seeing if they can fix it. 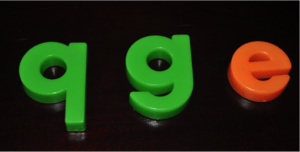 These magnetic letters are really great. Two-dimensional pictures of letters. Here, you have pieces of papers with letters on them. I have x, s, k, m. Can students then go ahead and replicate that? Put the four letters in and then gradually widen the field of their vision by presenting and spreading out the letters evenly on the page. You can do this challenge while retaining the speed of the visual memory recognition and the memory. Once this is mastered, you can start with 5 letters. You’re teaching the students to quickly recognize and visualize two dimensional symbolic pictures. Here, I’ve taken s, m, u, k, x and spread them across the table. It doesn’t actually create a word yet, but we can build our visual memory from original scenes to the different objects we’ve been using and putting it into the letters for kids to see it as they go. Google Docs is a great tool to help with developing visual memory. Form a collection of pictures that have some similarities (leopards or cats that look alike, or different kinds of animals) by searching Google Images and inserting chosen images onto a blank Google Doc. You might have 10 pictures all together, but the students don’t necessarily know which ones they’re going to grab. You select three of them and put it behind a visual screen to present to them. Raise the screen long enough that students can get it in their heads. The idea is not to rush or “stump” the students, but I usually just ask, “Do you have it in your head?” to where they can duplicate it. Gradually increase the number of pictures or the amount of time. Here, I’ll display these three cats that look the same. Can the child go ahead and replicate that? Another fun game is one that you might have played at a sleepover when you were growing up. I got a cookie tray from my mom and she would put things like a band-aid, a safety pin, a hair tie, a toothbrush, toothpaste, etc. on the tray. 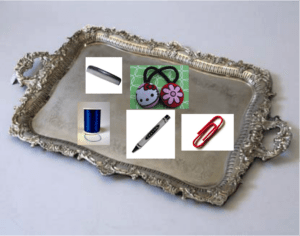 She would let us look at them for as long as we wanted until we had the objects in our visual memory, and then she would pull the tray away and ask how many things we could recall. This activity really pushes it into their visual memory vs the students’ auditory memory. Stay tuned next week for Visual Memory Tic Tac Toe and information about a program you can use at home with your child or at school with intervention of with a buddy!